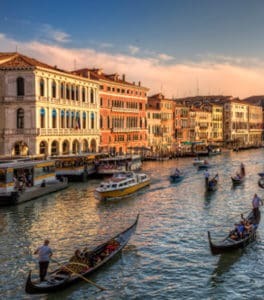 The Grand Canal in Venice is the main waterway of the city, where the noble families of the Serenissima Republic used to build their magnificent palaces. It’s not a case that the most beautiful palaces around the city are here, facing the Grand Canal, which cuts Venice in two parts. The Grand Canal of Venice is like a museum above water. Taking the vaporetto line 1 is like having a tour of an exhibition, where the ancient Venetian palaces are the works of art you come to see. We won’t make a list of all the palaces on the Grand Canal, but we want to point out the most impressive ones. From our hotel, we start a virtual itinerary, as if we were on the vaporetto, to discover the most beautiful palaces on the Grand Canal we find on the way to St. Mark’s Square. You probably already know this palace, since it’s the famous Venice Casino, the first casino in Europe. Once you go out from our hotel, the first vaporetto stop you find is the one called San Marcuola, which is located next to the Venice Casino. From here, you can easily notice the incision of a phrase on the external wall. But to find out what it says, we invite you to read our dedicated article, where we tell the story of this palace and its curiosities. Right in front of the Venice Casino, there’s another massive palace: Fondaco dei Turchi. This building is quite different from the others we’ll see on our tour since it was built to host Turkish merchants, coming to Venice to sell their products. The main reason why this palace has a huge entrance on the water, it’s because the goods were transferred here from the Grand Canal, while the merchants were in town. Today is not a residency for merchants as in the past, but it hosts the Venice Natural History Museum. Going on with the vaporetto, the Grand Canal makes a little curve and show us the beautiful Ca’ Pesaro. This majestic palace is one of the biggest ones facing the Grand Canal, and it presents particular attention not only to the architecture itself – geometrically perfect – but also to the nice decors on the facade. Ca’ Pesaro also hosts a museum, since when Duchess Felicita Bevilacqua La Mesa gave the palace as a present to Venice, with the promise that it would have been used to celebrate the Modern art and its artists. If Ca’ Pesaro was on our right, the Ca’ d’Oro palace is on the other side of the Venice Grand Canal and you can quickly recognize it for its beautiful multicolor marble facade that once was covered with gold. Next to it, there’s a “stazio”, which is a place where you can take a gondola ride. We are finally passing the Rialto bridge and reaching the Fondaco dei Tedeschi. You’re sure you’ve heard about this place before. Back in centuries, this building had the same function as the Fondaco dei Turchi: it was the residency of the German merchants who came to Venice to make some money. Today is a luxury mall that worths a visit, at least for the beautiful rooftop terrace, from where you have a 360 degrees view above Venice. Going forward with our virtual tour on a vaporetto, be ready with your camera, because this is one of those palaces that strikes. Ca’ Rezzonico is now the Museum of 18th century Venice, but initially, it was the home of the Rezzonico noble family, and during centuries it hots several important figures such as the English poet Robert Browing who bought it in 1888. Famous all over the world, the Peggy Guggenheim Collection is one of the most important museums of modern art in the whole Europe. From the vaporetto, this palace is easy to find, in fact, contrary to all the other buildings on the Grand Canal and around Venice has just one floor, which is quite uncommon. The reason why this palace seams uncompleted is that it’s actually unfinished. We don’t know exactly why the building remained uncompleted, but it probably was related to a financial problem. Another curious thing regarding this building is in the name, Palazzo Venier dei leoni, where “leoni” means lions and it refers to the lion that the Venier family used to keep in their garden (in a cage of course). Our last stop on the Grand Canal of Venice is Palazzo Salviati, which is not as old as the previous one, but it’s so unique that we had to include it in our list. This building was built for the Salviati family, famous for their Murano Glass factory, and it has a singular mosaic on the facade. It’s amazing. We hope you enjoyed our tour… now, it’s time to do it for real!